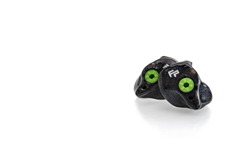 Fader Plugs®, a hearing solutions company based out of East Stroudsburg, PA, will be launching their Kickstarter campaign for their first of its kind product, the Fader Plug – the world’s first mechanical adjustable earplug. The campaign is set to launch this November 8th, 2017 and run for a sixty-day period. Fader Plugs’ CEO and Founder, Blaise Delfino, M.S. - H.I.S., and President and Founder, Dr. Gregory Delfino Au.D., CCC-A, invented this revolutionary product that will serve as a catalyst for the hearing preservation movement. This movement is essential to the company’s mission and engrained within the company culture. The Fader Plug is aesthetically pleasing and a modern twist on your traditional, and often times uncomfortable earplug. Its adjustable mechanical design allows the consumer to adjust volume without taking the plug out of their ear. The user controls the decibel reduction appropriate for their environment and will experience all sounds of speech and warning – making this the perfect device for those who work in the manufacturing realm, subway commuters, musicians, concertgoers – you name it. The Fader Plug is applicable from anyone in the pediatric population to the geriatric population, and is available in a universal application as well as custom. The team has completed the final phases of product development, and is solidifying a contractual agreement with a global leader in hearing healthcare as one of their manufacturers. Fader Plugs has filed their non-provisional patent this October. “The journey of the Fader Plug has been an incredible ride, and we are ready now, more than ever, to release this brilliantly engineered product and begin enhancing people’s quality of life. Kickstarter is the perfect platform that will allow us to effectively penetrate the consumer market.” – CEO and Founder, Blaise Delfino. To learn more visit, http://www.faderplugs.com.